Srila Sridhara Maharaja: The central principle of ISKCON philosophy is surrender, otherwise one will not be able to get to know the substance. Whatever you are seeing externally by means of your intelligence -- that is not going to help you to become acquainted with the real substance. Srila Prabhupada: That Dr. Radhakrishnan [author and one-time president of India] was victimized by Western philosophy. He had no real understanding of Indian philosophy. Srila Sridhara Maharaja: No matter; up to whatever extent they go, ultimately they end up becoming the worshiper of the self. They think that they will become God. The geocentric philosophy is not heliocentric. According to Srila Prabhupada [Srila Bhaktisiddhanta Saraswati Thakura], they are not heliocentric. They are geocentric. Their limit is only up to their senses. Beyond that, they don't have any understanding whatsoever. Ultimately their goal is Brahmaloka. Brahmaloka is the ultimate goal of these people, and beyond that they don't have any knowledge. The para-bhakti on the brahma-bhuta platform-that when one is situated on the Brahman platform, the transcendental platform, there the pure devotional service begins-they don't have any understanding about that. Srila Prabhupada: But that Radhakrishnan-inwardly he was afraid. I used to invite him from time to time. He used to be quite intimate with me. He used to say, "Please pray to God about me." Srila Sridhara Maharaja: Where did he say that? Srila Prabhupada: Where he used to stay in Delhi. He once wrote to me also, "After I retire, I shall join your movement." Srila Sridhara Maharaja: Sometimes the false prestige spoils everything. Srila Prabhupada: He used to have a lot of respect for me. Once he asked, "Are you writing everything in English?" So I asked him, "What do you do?" and he smiled. Srila Sridhara Maharaja: When he used to teach in Calcutta University, Bon Maharaja used to go to him, and once he took me with him, and before that once he brought him to Prabhupada. So this second time when we went to invite him I went with Bon Maharaja. Srila Prabhupada: Personally he was a fine gentleman. A brahmana, very cultured, but a mayavadi. He is dead now. Srila Sridhara Maharaja: Yes, but Rajagopalachari [another Indian political leader/ author] was a Vaisnava. Devotee (to Prabhupada): Your Srila Prabhupada has given you a lot of mercy. Srila Prabhupada: That is all due to your blessings. I do not know for how long I will be able to carry on, so I came to see Sridhara Maharaja. Srila Sridhara Maharaja (to Prabhupada): It is so wonderful that the will of the Lord becomes manifest through someone. Srila Prabhupada: I very much want, Maharaja, that you come and stay at Mayapura. Because Prabhupada always desired that you preach. He told me quite a few times, "Why don't you pull him out?" [They both laugh.] You know, I also tried to some extent before, but somehow or other it did not work out. Now, why don't you come and stay at Mayapura? Srila Sridhara Maharaja: At last Prabhupada told me: "You are an ease-lover. [Laughter] The qualifications - that you have." Srila Prabhupada: Yes, that's true. He told me also, "He is such a qualified person. Sridhara Maharaja is one of the finest preachers." I want to take you everywhere. At least at the place we have in Mayapura, people are coming from all over the world. Why don't you come and stay there? What is your objection to staying in Mayapura? If you just agree, then whatever kind of building you want, I will arrange it for you. They are trying to build a house for me, so both of us will stay there. And whenever you want, you can come here [to his Navadwipa math]. Srila Sridhara Maharaja: Yes, as long as I am alive to fulfill Prabhupada's desire. Srila Prabhupada: This is my earnest desire. Since you could not go around the world and preach, at least stay there and people will come to you. I shall make that arrangement. And if you stay there, then it will be very helpful to me also. Sometimes I need to consult with someone but there is no one. There is no one with whom I can consult. I feel this deficiency very greatly. Devotee: If he stays in Mayapura, then all kinds of people will get to hear from him. Srila Prabhupada: Yes, that's right. Srila Sridhara Maharaja: Yes, people from all kinds of cultural backgrounds will come there. Srila Prabhupada: Yes, they are already coming. And in that house I will make arrangements for an elevator so that you won't have to go through the difficulty of walking up and down the stairs. You won't even have to move a step yourself. I'll make arrangements for a car and a lift. Jayapataka Maharaja is telling me that he will build a house for me. So both of us will stay in that house. Most of the time I am just traveling around, so if you are there, then they can get some guidance. So Maharaja, please-give me the order and I will make all the arrangements for you. Srila Sridhara Maharaja: Well, I'll think it over and let you know. Srila Prabhupada: Let me make that arrangement, Maharaja. That planetarium [the "Temple of Understanding"] also will be built under your direction. My idea is to combine the Indian culture and the American money-the lame man and the blind man policy. I tell them also that this will be very beneficial for the world. Indian culture and varnasrama. Prabhupada's desire was to establish the varnasrama-dharma. So we have to do that: we have to establish our Varnasrama College. Let the people from all over the world come and learn about varnasrama. Srila Sridhara Maharaja: The effort that you are making to acquire the land in Mayapura-has that been successful? Srila Prabhupada: No, nothing has happened as yet, but we are buying the land. How far one can hassle with the government-of course they haven't yet said either yes or no. But we are buying the land now. They demand a very exorbitant rate, but what to do? We are buying; wherever someone is selling we are buying. When they see the Americans they want a price four times more, but what to do. I feel, let these poor people also have something. They are stealing, but what to do? I feel, let them also have something. Every month I bring one million rupees to this country and spend it for our development work-about seventy to eighty thousand dollars. Srila Sridhara Maharaja: So this is a big income for Indira Gandhi. Srila Prabhupada: That's what I say. With much difficulty I translate the books at night and they print it and sell it and send seventy, eighty thousand dollars every month to me here. Is India benefiting out of this, or losing out of this? Yet they [the Indian government officials] are accusing them [the American devotees] of being C.I.A. agents. 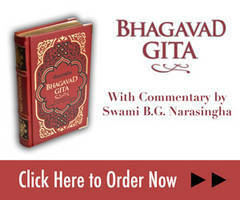 [Bhakti Vilasa] Tirtha Maharaja used to say, "The American government has given Swamiji two million dollars." As if the American government could not find anything better to do or any better person to give the money. For making them chant Hare Krsna and dance they would give me two million dollars. Srila Sridhara Maharaja: A man from the Central Intelligence Department took initiation from me. He was asking me [about the American devotees]. I told him, "These are nothing but rumors. I know Swami Maharaja for a long, long time. I know him very well, and his movement is nothing but a purely spiritual movement." Actually, what they are thinking is that previously they [the Westerners] used to send the missionaries, then they used to send the merchants, and then the army used to come and take over. But those days are no more. Though if a net of such a faith of universal religion [as Gaudiya Vaisnavism] could be cast throughout the world, then perhaps that could be actualized in future. Srila Prabhupada: Yes, this study has been quite proper. This is what our plan is. I tell them that, "You work in this direction, and in the future everyone will recognize this movement." The American government is already saying that this movement is spreading like an epidemic. (To his disciples:) Who said this? Devotee: One congressman has said that. Srila Sridhara Maharaja: Who said this? Srila Prabhupada: One American congressman from the Senate said this on the television. "The Hare Krishna Movement is expanding like an epidemic, and if we allow them to go on like this, then one day they will capture the government-within ten years." Srila Sridhara Maharaja: All the governments are becoming alarmed. (Laughter) Even this government, if they [the Western devotees] can conquer the masses and get them to support them. Srila Prabhupada: Yes, that is the fear of everybody. Srila Sridhara Maharaja: Ultimately, it may become the "world state" religion. Srila Prabhupada: Automatically it will become so; that is the idea I have. Srila Sridhara Maharaja: America was being accused of trying to make a one-state world so that, "Let there be just one state, and then there won't be any wars. If the whole world is made into one state, then there won't be any wars." Srila Prabhupada: Yes, I replied to that, "You may make a one-state world. But if you make the populace into dogs, then there won't be any use, they'll just keep barking. You have to make them into human beings." Srila Sridhara Maharaja: Yes, they'll still go on fighting with each other. Srila Prabhupada: Right, that is their nature to fight. So first of all you have to make them human beings; that is the brahma bhuta prasannatma, sama sarvesu bhutesu. Srila Sridhara Maharaja: Then, mad bhakti labhate param. Srila Prabhupada: When they come to that stage, then it will be more useful; otherwise there is no hope. It is not impossible to happen. Srila Sridhara Maharaja: Yes, when there is a common center, then everybody can unite. Everybody can be harmonized. But that has to be real. If it is fictitious then there won't be any achievement. Srila Prabhupada: I am hearing that the present American president, President Carter, he has some such plan and he is discussing it with Indira Gandhi. He is consulting with Indira Gandhi quite intimately. Srila Sridhara Maharaja: Yes, they are accepting our broad policy. From what I hear from the radio and newspaper, it seems that their policy is becoming much more broader than before. Srila Prabhupada: Besides that, they don't have any other way. Otherwise they cannot achieve what they are actually wanting-the peace through the United Nations; that cannot be achieved. Srila Sridhara Maharaja: Yes, nothing less than Krsna consciousness will be able to give them that desired peace; nowhere else will they find it. Srila Prabhupada: Yes, bhoktaram yajna tapasam, sarva loka mahesvaram. So that is what I was telling them, that, "Stop fighting and making all those legal suits; then so nicely the preaching can be done in India in every village, every town." One disadvantage with these people is the language, but still, you must have heard, wherever they are going they are getting a very good reception. My Geetar-gan-first I printed five thousand, then ten thousand, then thirty thousand, but this time we are printing one hundred thousand and they are selling very nicely. In Bengali we are printing various books-Geetar-gan, Bhagavan Ekankatha, Bhagavata Darsan. In Hindi also, we are selling many books, like at Kumbha Mela we sold many, many books. Srila Sridhara Maharaja: Yes, this is what Krsna consciousness is, and people will naturally wonder what is there in it that captured the whole world in just ten years. Srila Prabhupada: Now that they are opposing it, this is a great credit. Srila Sridhara Maharaja: Yes, that's why the governments are organizing the oppositions. Srila Prabhupada: Yes, they are clearly mentioning that, "If they get a chance to expand unrestrictedly, then in ten years' time they'll capture the governments." Srila Sridhara Maharaja: Yes, if the mass is converted and their votes can be acquired, then the government will be captured. Srila Prabhupada: Yes, and these are all young men. The young class of people have accepted it. One scholar, Dr. Stillson Judah, has already predicted that this movement will not be destroyed, because it has entered into the bones and marrows [of Western culture]. Srila Sridhara Maharaja: Who is he, where is he from? Srila Prabhupada: He is an American, a professor in the Berkeley University.